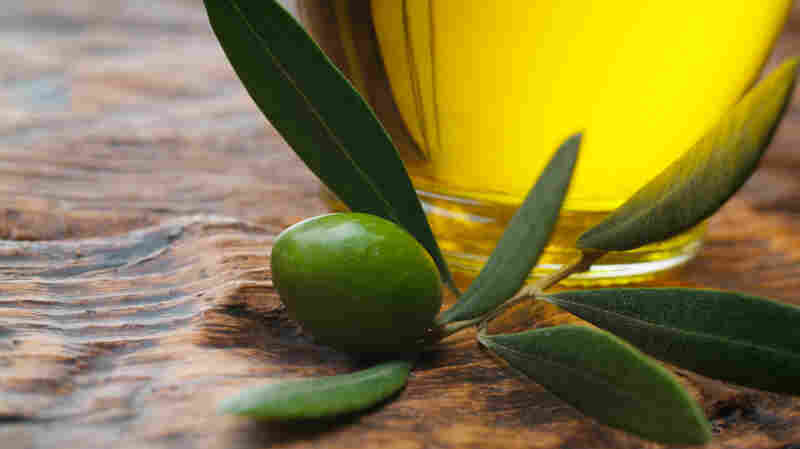 Spanish Test: Mediterranean Diet Shines In Clinical Study : Shots - Health News People who stuck with diets rich in olive oil and nuts had about a 30 percent lower risk of experiencing a major cardiovascular problem than people who followed a low-fat diet. Don't hold back on the olive oil, a Spanish study concludes. Editor's note: On June 13, 2018, the New England Journal of Medicine retracted the study that was the subject of this story. You can read about the reasons here. Pour on the olive oil in good conscience, and add some nuts while you're at it. A careful test of the so-called Mediterranean diet involving more than 7,000 people at a high risk of having heart attacks and strokes found the diet reduced them when compared with a low-fat diet. A regular diet of Mediterranean cuisine also reduced the risk of dying. The findings, published online by The New England Journal of Medicine, come from a study conducted right in the heart of Mediterranean country: Spain. A group of men and women, ages 55 to 80 at the start of the study, were randomly assigned to a low-fat diet or one of two variations of the Mediterranean diet: one featuring a lot of extra-virgin olive oil (more than a quarter cup a day) and the other including lots of nuts (more than an ounce a day of walnuts, almonds and hazelnuts). The Mediterranean diet is rich in fish, grains, nuts, fruits and vegetables. The diet is low in dairy products, red meat and processed foods. In this study, funded mainly by the Spanish government, the researchers made sure people got regular training sessions in the particulars of each diet. They also checked people's actual consumption of olive oil and nuts with lab tests. One thing the researchers didn't do was set any limits on calories or targets for exercise. While lots of research has found benefits from the Mediterranean diet, many of the studies have observed what people have eaten and looked for associations. One of this study's strengths is that it randomly assigned people at high risk of developing cardiovascular disease to diets that stood to help them. The study was stopped early (after a median follow-up of 4.8 years) because the benefits from the Mediterranean diet were already becoming apparent. Overall, the people consuming the diets rich in olive oil or nuts had about a 30 percent lower risk of having a heart attack, stroke or dying from a cardiovascular cause. In absolute terms, there were about 8 of those problems for every 1,000 person-years in the Mediterranean diet groups compared with 11 per 1,000 person-years in the low-fat diet group. How does the Mediterranean diet work? The prevailing theory is that it lowers bad cholesterol and triglycerides while increasing protective good cholesterol. It may also also help the body's ability to process sugar.